When Charlie was just two, we were gifted a Tranquil Turtle from cloud b. We were trying to have another baby at the time and we thought if he liked it, we could keep it in the nursery for the new baby. He liked it so much that it moved downstairs when he did. Ok then. 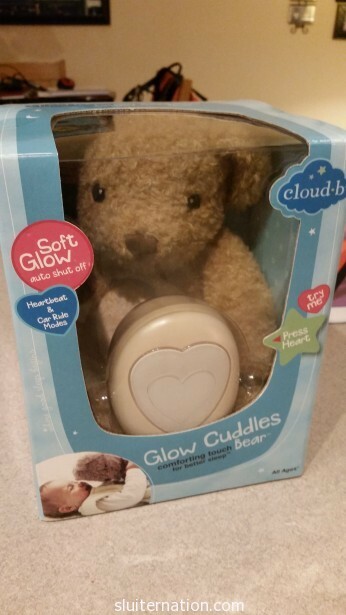 Recently, cloud b reached out again, and sent Alice a Glow Cuddles Bear. We were so excited because we have fallen pretty hard for cloud b products. And the great news is that one of YOU will win the cloud b Glow Cuddles Bear too! But why would you want one? Read on for the Top Five reasons to shop cloud b! One of the greatest things as a parent is when your child can finally put him/herself to sleep. Eddie was terrible at it, but Charlie was good. As a baby, he had a glow worm whom he called Glowy, and then he got his Tranquil Turtle. The way the Tranquil Turtle played soothing water sounds and made glowing “waves” on his walls mesmerizes him and helps him to quietly fall asleep without needing someone in the room. It’s true. Cloud b has pediatricians and parents constantly researching and giving input. I am guess that is why Alice already seems to love her Glow Cuddles Bear and it’s heart beat sound. I mean…awww!!! And so soft! Yes, these cuddly lovies turn themselves off. That may not seem like a big deal because, hey, you aren’t in the room, right? However turning themselves off means saving on batteries AND it means if you sleep in the same room with your child for whatever reason? The light beat of the bear’s “heart beat” or the soothing sounds of the turtle’s sea sounds will not go on and on all night. 5. They make great gifts! You don’t have a baby? That is fine! Give a Cloud b animal as a gift! Alice agrees. To enter to win a Glow Cuddles Bear, simply follow the instructions in the Rafflecopter widget below. Contest closes midnight of March 24 and is open to US shipping addresses. Disclaimer: This is not a sponsored post. 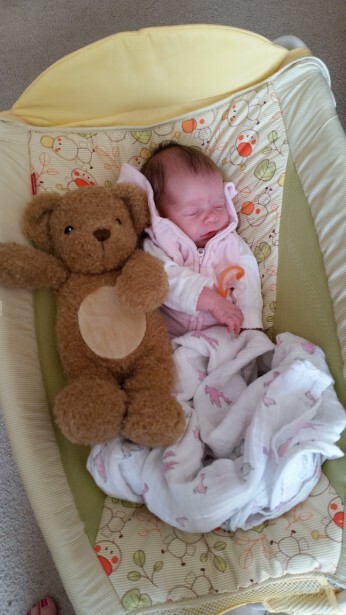 Cloud b sent us a Glow Cuddles Bear and is providing the spoils for this giveaway. I was in no other way compensated for this post. All opinions are my own. So cute…Alice and her bear. I would definitely gift one of these to a friend. This would be awesome for my baby coming in August! Kiddo is getting more and more interested in his own bed, but he does NOT like the dark. This sounds like a great idea! Super cute. And the bear’s adorable too. Hehe. My lovies are my nieces. The oldest is four and half and is my mini-me…don’t ask me how as we live 2,000 miles apart and i only see her once a year. The youngest is now three months old. She looks exactly like my sister. Lovies are still an important part of my now 10 and 5 year olds existence. Also such a big fan of Cloud B. Highly recommended! These look so cute and cuddly! Ervin has a “bapi” swaddle blanket. Ivy has a lambie. Henry has “Tinny”, a plush tinman from the wizard of oz museum. And Essie had a bear, but and then something else, but has always been attached to this elephant sleeping bag. My daughter Joanna would love this! Glad Alice enjoys it so much.